For an applicant with an extensive education or employment history this compact resume template may be just what is needed. A problem many people encounter when writing their resume is having too much information to fit on the page. There needs to be a balance between adding a complete record of one's career history and not overwhelming the reader with a resume that has too much information. We have an article about how to make your resume more effective. Careful evaluation of the user's career history is needed to include only the relevant facts, this will make writing the content more manageable. Upon inspection of this compact resume template the first item noticed is the user's name, which is aligned to the left. It is very noticeable due to a much larger font and it being bold face. The relevant contact information is aligned to the right side of the page. The details are separated from the personal information by a thin underline. The heading titles are inline with the first line of the content in each section. This collapses the data into a more compact form allowing more info to be put on each page. Careful addition of the content must be observed to be sure not to have the resume look cluttered and difficult to read. The names of each business and school are written in a bold font. The dates of each event are aligned to the right side, a quick visual scan down the right side reveals the integrity of the work and education histories. If a user has gaps in their dates they may not want to use this compact template, but we do have many, many more, one of them should work each one has its own purpose. There are different styles to help alleviate each user's individual resume writing issue. 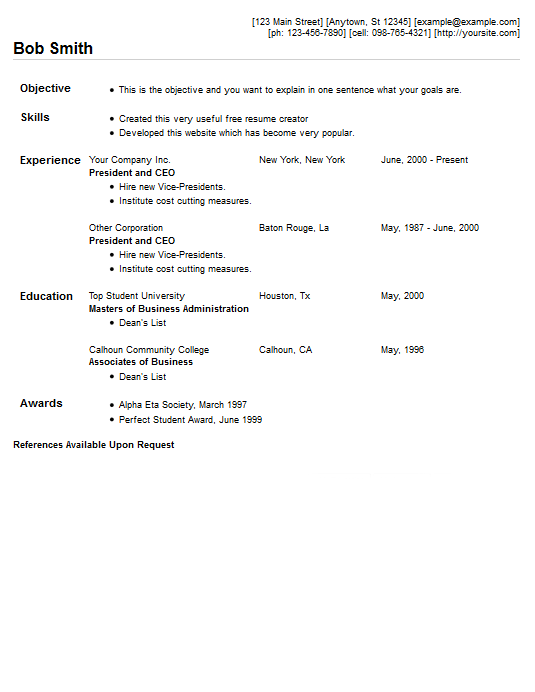 Get this template by using our free resume creator.